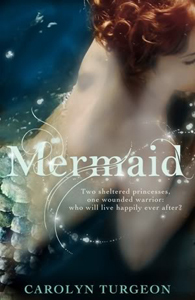 A retelling of the classic “Little Mermaid” tale, this is an interesting, even darker take on the story. The atmosphere is fantastic, Nordic and stark, a perfect setting for an ocean myth to take hold. There is a nice contrast between the lushness of the ocean kingdom where Lenia, the mermaid, lives. This place is full of colors and life, while the convent where Margrethe is hiding, or even the castle she later travels to, is bare and almost colorless. It makes for an interesting work. The characters themselves are well crafted, and very different from the idea we might have acquired from the original tale. Lenia is complex character, not necessarily an easy one to love at first, but there is a power to her, a strength that earns her our respect if not our whole-hearted love. By the last page, we are cheering for her, breathless to see her end up safely where she needs to be. Margrethe is less complex, her actions clearer, but nonetheless important. Although we do find ourselves hoping for Lenia to be the victor, we also root paradoxically for Margrethe to have her happy-ever-after. This is a wonderful story shaped into a wonderful, fresh novel. It is not for the younger teens, though, since there are some sexual moments, but for the older young adults and for adult themselves, it is a fabulous, magical book.